Buñuel's first film in 20 years eschews much of his dabbling in Surrealist and Dadaist style; a director who changed approach and aesthetic frequently, he is quite unclassifiable in most respects. His grim realism here anticipates Pier Paolo Pasolini's early 1960's films; the directors share a mutual concern for the slums of mega-cities and and the moral ambiguity of the criminal underworld. Borrowing quite heavily from Italian neorealism, Los Olividados is an unflinching look at the vulgarity, filth, superstition, and illiteracy that these Mexican children have inherited as a result of terrible poverty. A group of street kids, including the misguided Pedro, are sucked into the dark orbit of the sociopathic ex-convict teen, El Jaibo - who eventually commits a murder and makes Pedro an accessory. Soon Jaibo is ruining every attempt Pedro makes at improving himself; he steals from Pedro's new employer, and turns up to wreak havoc outside the delinquent centre where Pedro is sent to clean up his act. Children, here, may be victims of their uneducated, indifferent elders and the vicious cycle of the slums, but they, too, are ugly and amoral; they attack the infirm, the crippled, and the blind with no pangs of conscience. In the fight for survival and bread, there is little time to spare for moral quandaries; and the adults they encounter are equally as vicious and petty. Pedro's mother has no forgiveness or tenderness in her heart for her children; she is cold and bitter with her circumstances. Another hostile-to-change old man is, quite literally, blind to the realities of the street kids' lives and totally lacking in empathy. He is symbolic of the conservative attitude to law and order and juvenile delinquency; a hang-em-high mentality where criminals are seemingly created in a vacuum. Buñuel, always a left-wing moralist at heart, sketches a bleak portrait of contemporary poverty; but the film's wild originality and bursts of poetic surrealism transform it into much more than a homage to the neorealists. An egg is thrown at the camera and slowly oozes over the lens; Pedro has a dream, closely aligning the maternal and death; a corpse reaches out from under his bed as he pleads for his mother's affections. There is little redemption to be found in the short, brutal lives of these peasants, child and adult alike. 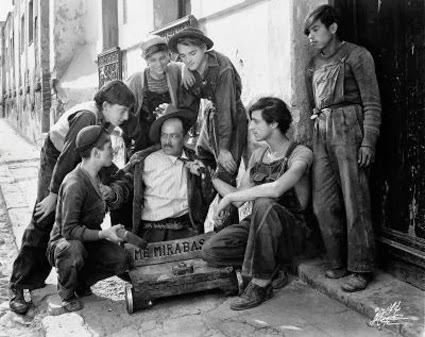 Much of the Mexican art community was disgusted with the film's portrayal of their homeland, but it went on to be shown at Cannes in 1951 and win the prize for Best Director. Buñuel cast an unflinching gaze on the moral rot of the slums, unwilling to ennoble the suffering poor or efface their worst qualities. Moralist or not, he maintained the urgency and honesty of neorealism by refusing to shy away from the unromantic conclusions to such dark, burdensome lives.